Tasco Sound Shield Hard Hat Model Dielectric Ear Muffs offer extremely good noise reduction (NRR 28) in a hard hat mount ear muff. 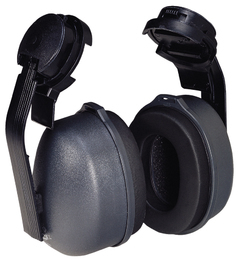 These Sound Shield Hard Hat Model Ear Muffs also feature a centered mounting assembly that ensures a better fit, which means better noise reduction and improved comfort. Tasco's patented Soft-Seal™ ear cup cushions also serve to make these muffs more comfortable. Available in red, and high viz green. (NRR 29) Tasco Sound Shield Multi-Position Dielectric Ear Muffs offer heavy-duty hearing protection in a versatile three-position design. Recommended by the USAF!